This campaign ended on November 01, 2018, but you can still make a gift to Marquette University by clicking here! Text, email or share your personal link with friends. If you generate 3 gifts you'll receive a social media shout out from @MarquetteAlumni! Text, email or share your personal link with friends. If you generate 5 gifts you'll receive all incentives above + a personal Thank You video from a student! Text, email or share your personal link with friends. If you generate 10 gifts you'll receive all incentives above + a piece of Marquette swag! Text, email or share your personal link with friends. If you generate 15 gifts you'll receive all incentives above + an official 2018 MU Reunion+Homecoming TShirt! Text, email or share your personal link with friends. If you generate 20 gifts you'll receive all incentives above + a personal Thank You letter from Dr. Lovell! The next 25 alumni to make a gift of $25 or more will receive a limited-edition McCormick hall poster. Honor your 45th reunion milestone by supporting current and future Marquette students! We hope you had a great time during Alumni Reunion + Homecoming weekend! Thousands of alumni came back home to reminisce with fellow classmates and connect with students at the most exciting time of year on campus. Even if you couldn't join us for your reunion, you can still support your class and celebrate your reunion by participating in the reunion giving challenge. Make your gift today! 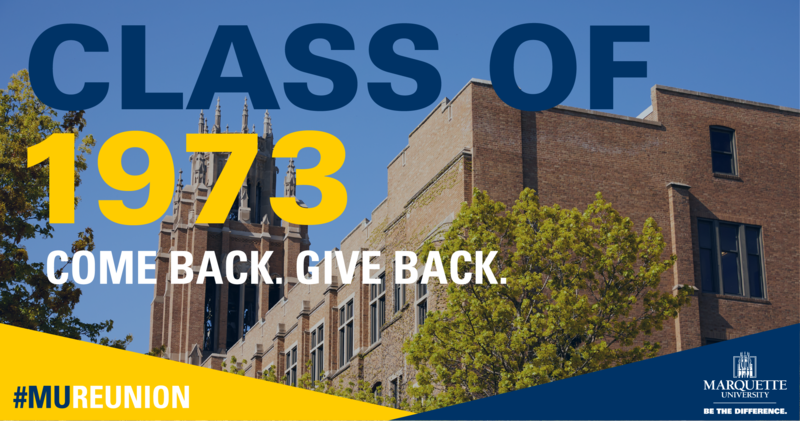 All gifts made to Marquette's current use funds count towards the 1973 Reunion Class Gift goal. Scholarship Funds: Provides critically needed scholarship aid. Blue & Gold Fund: Directed to scholarships for Marquette student-athletes. Marquette Fund: Strengthens academic and student life, enables innovation, improves facilities and more. Bridge to the Future Scholarship Fund: Assists students who experience a change in financial circumstances during the course of their Marquette education. *If you prefer to make a gift to another fund please contact Kelly Jahnz at kelly.jahnz@marquette.edu or 414-288-0395. *Class of 1973 Reunion gifts made to Marquette in other ways are reflected in the campaign totals.